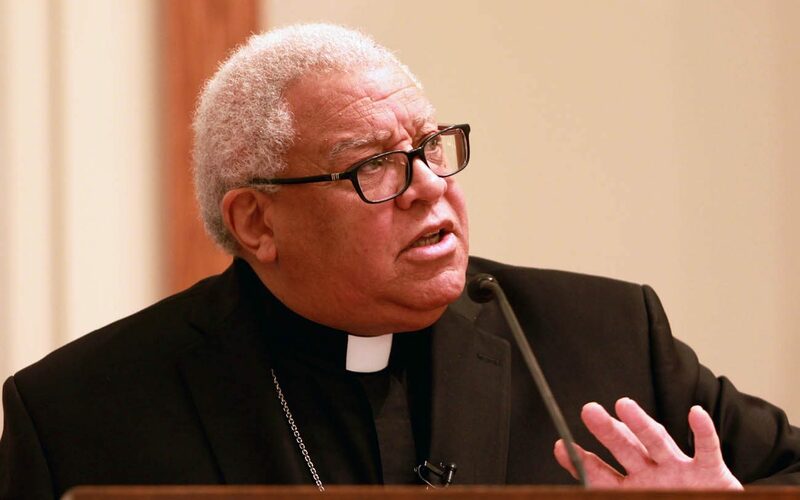 CHARLOTTE, N.C. (CNS) — The Catholic Church must confront the sin of racism, listen to people who have been oppressed, and seek reconciliation in part by promoting people of color into leadership roles, said Bishop George Murry of Youngstown, Ohio. As chairman of the U.S. bishops’ Ad Hoc Committee Against Racism, he gave a talk Jan. 27 at St. Peter Catholic Church in Charlotte about racism in the church’s history and how the committee is addressing the issue. About 300 people attended the lecture, including members of Our Lady of Consolation Church. The majority black parish in downtown Charlotte has fostered an ongoing dialogue on race with members of St. Peter Church, a majority white parish less than three miles away. The dialogue came in the wake of a fatal police shooting that sparked violent protests in the city in 2016, leaving one Consolation parishioner dead. “Racism is a sin that divides the human family and violates the fundamental human dignity of those called to be children of the same Father,” Bishop Murry said, and the church must become “a consistent voice” to eradicate it. “In his letter to the Ephesians, St. Paul tells us Jesus is our peace. It is by means of his shed blood and broken body that the dividing walls of enmity have been demolished,” the bishop said, referring to Chapter 2, Verse 14, of the Letter to the Ephesians. The U.S. bishops’ Ad Hoc Committee Against Racism, formed last August, aims to address the problem of racism in the Catholic Church and the wider community, “and the urgent need for the nation to come together to find solutions,” he said. He said the committee is working to bring together people of various races, faiths, cultures and backgrounds — and then listening to them. A national summit of religious leaders and others will be convened this year to discuss the sin of racism and find ways to build bridges, he announced. The Ad Hoc Committee Against Racism also is organizing a series of “listening sessions” across the country, Bishop Murry said. Intended to be a “national conversation on race,” these sessions will take place in parishes, schools, seminaries, Catholic Charities organizations, Catholic health associations and social service agencies — “in every Catholic organization throughout the country,” he said. “The goal will be to allow people to listen to each other, to exchange ideas, to become educated and change hearts,” he said, in part by listening closely to people who have experienced prejudice firsthand: African-Americans, Latinos, immigrants, Jews and others. The committee will issue a study guide designed “to encourage people to come together and to overcome their hesitations and their fears, and to talk frankly with each other,” Bishop Murry said. Also, a pastoral letter on racism is expected to be issued by the bishops in 2018. “There are some people in our country who are not going to want to have anything to do with any discussion about race because they think that they’re OK, it doesn’t affect them, ‘leave me alone,'” he said. The study guide is meant to help people have earnest conversations with each other, he said. “In imitation of Christ, we the church must be willing to give our total lives over to the liberation of women and men by defending the dignity and fundamental rights of every human person — and this includes a visible denouncement of racism,” he said. Reconciliation can be fostered by finding ways to include people of color in decision-making and leadership roles within the church, he said, adding that the church also must confront racism wherever it occurs. Guilfoyle is editor of the Catholic News Herald, the newspaper of the Diocese of Charlotte. Do this racists’ realize that Jesus had dark skin?